1 February, 2017. I went to Standing Rock because I felt there wasn’t much mainstream coverage of the Dakota Access pipeline protests taking place there. I saw that photograph coming and I waited for about 15 minutes to get it. I try to mix fine art with photojournalism – I’m really into symmetry and perspective. 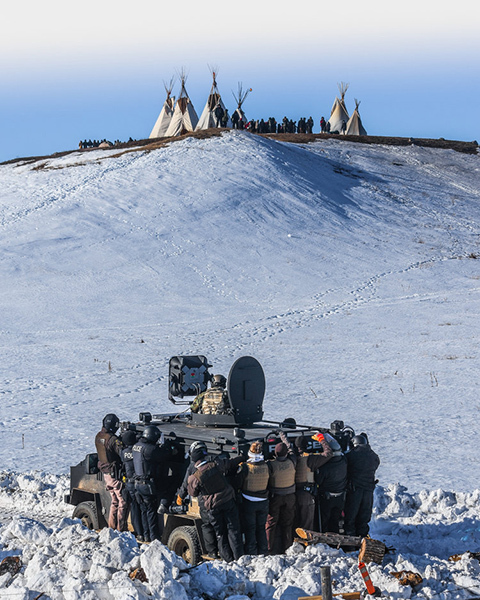 I was behind the police, looking up at the Native Americans – I think 75 people ended up getting arrested. Since photographing the protests, I’ve kind of been adopted by the Lakota people – they’re like family to me. I hope to help amplify indigenous voices. See our complete coverage of the International "Best" photographs of 2017 here. Happy 95th Birthday to Gallery photographer Tony Vaccaro!! Tony Vaccaro turns 95 on December 20, 2017. In 2017, the Emmy-nominated documentary film "Underfire: the Untold Story of Tony Vaccaro" aired on HBO, following its November, 2016 premiere. 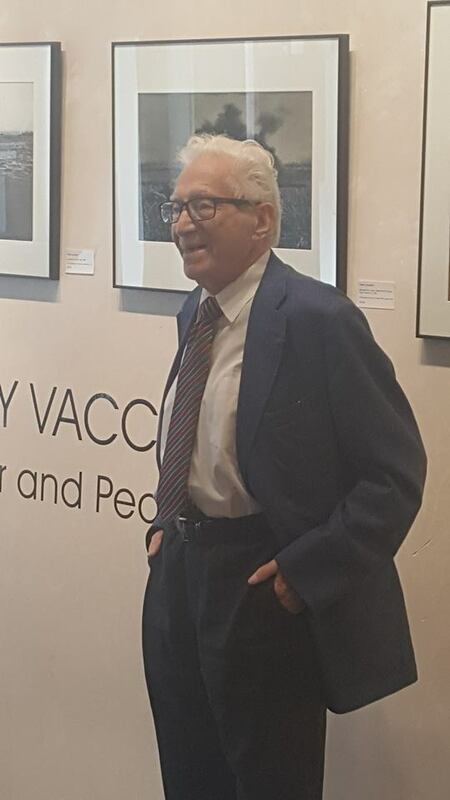 In July, Tony returned to Santa Fe, New Mexico 57 years after his famous photo-session with Georgia O'Keeffe to attend the opening of the exhibition "Tony Vaccaro: War and Peace" at Monroe Gallery of Photography. 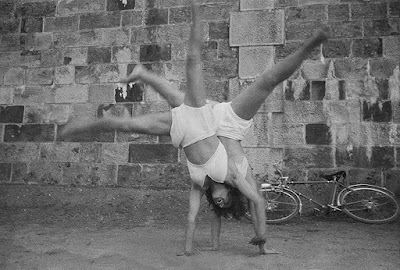 In World War II, Tony Vaccaro played two risky roles, serving as a combat infantryman on the front lines, as well as a photographer who shot 8,000 photographs. Returning to the States in 1950, Tony started his career as a commercial photographer, eventually working for virtually every major publication: Flair, Look, Life, Venture, Harper’s Bazaar, Town and Country, Quick, Newsweek, and many more. Tony went on to become one the most sought after photographers of his day. Monroe Gallery of Photography is proud to present a special pop-up exhibition of photographs by Tony Vaccaro on the occasion of his 95th birthday. Visit the exhibition on-line at www.monroegallery.com, or in the gallery through January 21, 2018. And stay in contact with Monroe Gallery for several Tony Vaccaro exhibits to be announced for 2018! Two current Monroe Gallery of Photography exhibits have received National and International press acclaim. A seasonal exhibition at the Monroe Gallery of Photography in Santa Fe, New Mexico, takes a look at life in winter, encompassing battlefields on the western front in the second world war, celebrities on the ski slopes, and the stand-off at Standing Rock. The show runs until 21 January 2018. Both exhibits continue through January 21, 2018. Gallery hours are 10-5 daily, more information may be found on our website, www.monroegallery.com.